Here are the Slides from James Grenning's talk at the Agile Alliance Technical Conference, Raleigh, NC April 7, 2016. This article describes one of the most direct benefits of applying Test-Driven Development to your code. If you are dong Debug Later Programming, you better read this. This paper describes the special challenges of using TDD in embedded software and how these challenges can be overcome to streamline embedded software development. 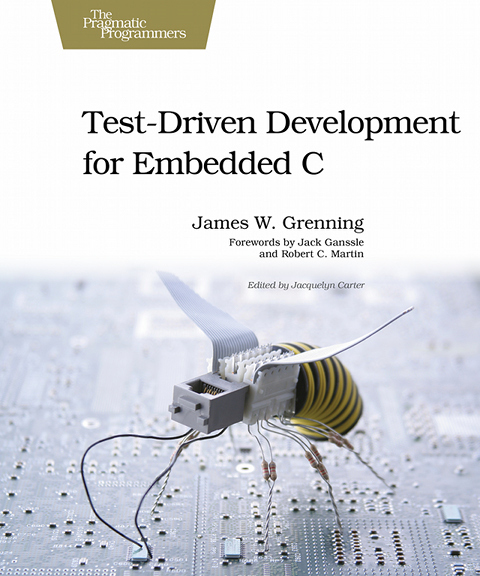 It provides examples in C and is based on my book Test-Driven Development for Embedded C.
You are getting started with TDD, but have existing code? You want to get some of your challenging C/C++ code under test? You have run into some apparent show stoppers? Don't give up! This article contains a step by step recipe to help get your code into a test harness. It also contains a series of C/C++ code problems that get in the way of unit testing. Each problem named comes with one or more suggested solutions. Also, many of the solutions provide links to articles with more detail. Many of the problems described arise from trying to get embedded systems code that has only been compiled with the target hardware cross-compiler, to compile off-target. These problems are not unheard of for non-embedded C/C++, so any C/C++ programmer can get some insight into getting your legacy code under test using this approach. Test problems come from dependencies, so If you can relate the C/C++ specific advice to your language, there is something here for non-C programmers as well. To help you get started, I've created a CppUTest Starter Kit on github that you can use to help get started. The started project describes how to setup your environment and has example tests, code, and mocks. C does not have to be spaghetti code. It can be modular and flexible if you apply the SOLID design principles. In this tutorial, we look at applying Single Responsibility, Open-Closed, Liskov Substitution, Interface Segregation and Dependency Inversion principles to C. SOLID gives good guidance on modularity and coupling; these principles are not just for programmers with an OO language. Back in 2002, in American Fork, UT, James was facilitating and XP planning meeting. The meeting stalled with the two most senior people volleying the ideas back an forth, while the others got a virtual nap. As a engineer (and consultant), James had a problem to solve. Get the meeting on track. Planning poker was born. Progress Before Hardware shows how Test-Driven Development can help an embedded software effort get started before they have hardware to run their code on. I wish I knew this when I did not have hardware during the 80s and 90s. These are the results of an on-going survey of how long an embedded engineers has to wait for an incremental build. Here are my slides from OOP 2015, Munich.